Ties between India and Japan have started to blossom this past year. There’s plenty of space for more growth. “Asia’s fastest growing relationship.” That’s one way of describing ties between Japan and India in recent months. 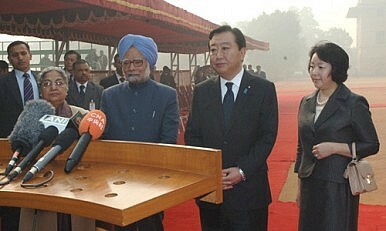 And, while December 28 saw international attention focused on the elaborate funeral ceremonies for Kim Jong-il, Japanese Prime Minister Yoshihiko Noda was working to consolidate progress during talks with his Indian counterpart Manmohan Singh in New Delhi. Relations between Asia’s second- and third-largest economies have progressed significantly since 2000, when Prime Minister Yoshiro Mori effectively neutralized diplomatic ties following India’s 1998 nuclear tests. Relations were given a boost under Prime Minister Shinzo Abe (2006-07), who talked of an “Arc of Freedom and Prosperity” stretching from Japan to Eastern Europe and taking in India. When the Democratic Party of Japan took the reins of power in 2009, many feared a downgrading or at least a slowing in bilateral progress, a concern that appeared to be justified in light of Prime Minister Yukio Hatoyama’s initial stated focus on rebalancing relations with Washington and improving ties with China. Yet despite his domestic challenges, Hatoyama still paid a visit to India in late December of that year, no doubt in part on the urging of Foreign and Trade Ministry officials keen not to see relations slide. Hatoyama’s successor, Naoto Kan, made no particular overtures to India except for indirectly endorsing a so-called New Growth Strategy that encouraged the export of nuclear technology, which was soon followed by the announcement that Japan would enter bilateral negotiations with India for providing civil nuclear energy technology. But setting aside the failure to conclude a nuclear deal, 2011 saw some big steps forward on the economic front. In February, for example, the long-awaited Comprehensive Economic Partnership Agreement was finally signed after 14 rounds of negotiations, coming into force on August 1. Indeed, economic ties have long been the foundation for cooperation, as further demonstrated this past week when Noda met Indian Railway Minister Dinesh Trivedi, who expressed a strong desire to import Japan’s bullet train technology into India. Japan also pledged readiness to invest $4.5 billion in the Delhi-Mumbai Industrial Corridor Project, the “flagship” economic initiative between the two governments. Japan’s foreign direct investment into India, meanwhile, has continued to soar, reaching $3.62 billion over the past two years. With some business interests in Japan fearing saturation and/or instability in the Chinese market, the growing Indian opportunity is seen as one of the few frontiers yet to be properly explored. All this needs to be seen in the broader context of shifting and developing power balances within Asia, especially the U.S. pivot back to Asia and a rising China. Of course, both India and China were keen to stress that the meeting wasn’t aimed at a third party (i.e. China), but with Beijing having grown increasingly assertive, it seems highly unlikely the issue of how to deal with China’s rise wasn’t discussed. Yet barriers to an even warmer India-Japan relationship remain. For one, while Delhi and Tokyo have both clearly made a strategic decision to work closely with the United States, Japan’s commitment is bound to remain much stronger than India’s. On the Proliferation Security Initiative, for example, the two have differing views. Japan has been praised for demonstrating clear leadership on helping prevent the proliferation of weapons of mass destruction, while India remains wary over the U.S.-origins of the initiative. But as we enter the 60th anniversary year of diplomatic relations between India and Japan, there will undoubtedly be further progress. The joint maritime exercises between Japan’s Maritime Self-Defense Force and the Indian Navy announced during Indian Defense Minister A.K. Antony’s visit to Japan on November 1, for example, are something to keep an eye on. Such agreements have underscored the extent to which the DPJ has adopted a security strategy largely in line with that of the Liberal Democratic Party – and just how far this relationship could go. Victoria Tuke is a PhD candidate in the Politics and International Studies Department of the University of Warwick and 2011 Daiwa Scholar at the Daiwa Anglo-Japanese Foundation in Tokyo. An upcoming visit by Shinzo Abe to India underscores just how close bilateral relations have become.